Thank you to Advanced Satellite Prod. 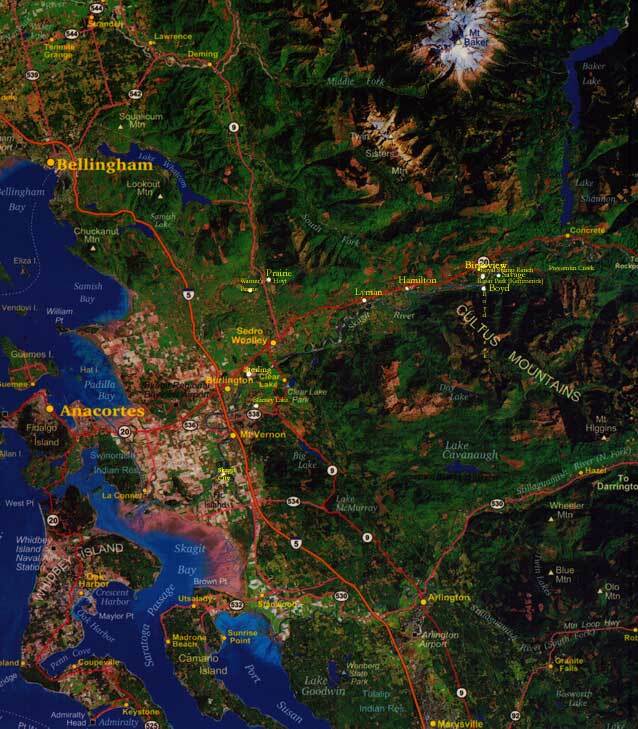 Inc. for giving permission to use their satellite view from way up in the heavens of the Skagit/Whatcom Co. area. Go to this link for a larger view of Skagit, Whatcom and Island County, I should warn that the image will probably take a minute or two to load as it is a big file done at 200 dpi to give you a clearer image to use as reference. 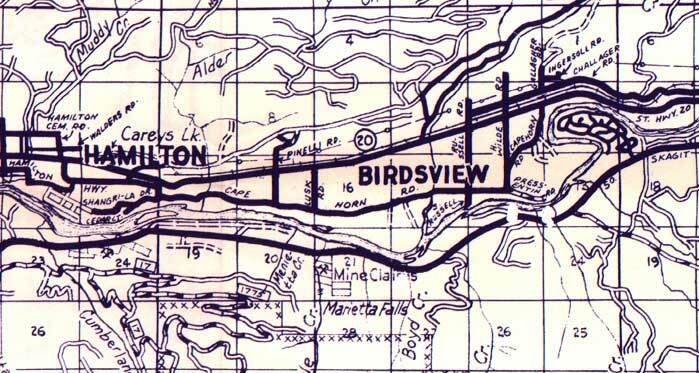 A geological description of Birdsview can be found here. Legend has it that Marietta Falls & Marietta Creek were named for the two Torrey sisters; Georgetta Savage [called Etta] and sister Olive Clarrisa Boyd, which has caused a bit of confusion as to whether or not Mary was another nickname for Olive, also called Doll affectionately by her husband and family. I've also seen the creek listed as Loretta Creek, which only deepens the mystery. With the help of George Savage, Alex Boyd staked a pre-emptive claim on the NE 1/4 of SE 1/4 section 21 and W1/2 of SW1/4, Lot 5 of Sec 22 December 1882. If you can find Pressentin Rd. [Primitive Rd.] on the north side of the river (where the old ferry landing was also) and directly on the south side of the river is the Savage family property; Barb Thompson, great-granddaughter of George & Etta Savage still owns the bulk of the land, that has been in family hands since 1878. Update: Barb sold the property around 2010. 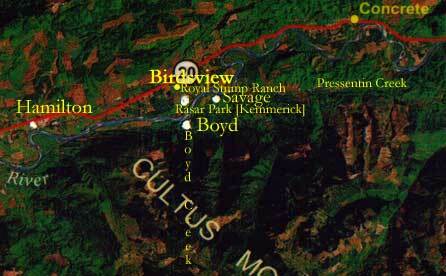 The August Kemmerich Family homestead directly across from Boyd Creek is now Rasar State Park. To get there, folks drive down Lusk Road from SR 20 to go to the Park and enjoy it's facilities. Terrific place to camp with the family if you get up this way. The Kemmerichs made their claim in Feb. 1878. The Pressentin Family were just to the south-east of the Savages. Sec 16 was the designated property for the schools by county government and was later auctioned off. It just so happens in our family story that Mabels sister Grace Boyd Pape and husband Jim Pape; would encourage Mabel to bid for an 80 acre tract of the NE area of section 16 in February of 1925, Jim drove Mabel to the courthouse with some car problems on the way, Mabel was sure they would miss out on making a bid. She didn't have to worry as she ended up being the only person there to make a bid for the property. This just pleased her to pieces as now she felt she could settle down with her children of five once and for all, as she had grown tired of the rolling stone life with husband Tom Royal, a lifelong logger who didn't mind moving from camp to camp for work. With a lot of hard work all around they turned the Stump Ranch into a home, Mabel later wrote about the adventure in a story title "Mabels Brood or Ten Years on the Stump Ranch". The Savage children of George & Etta still living and important to the area at this time were: Bert, Ira, Katy, Leslie and Harry, a couple of whom owned and lived on the old homestead. Kemmerich daughter Anna Kemmerich Ackerman was a close neighbor to the Royal's and is remembered with fondness. 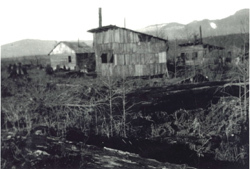 Tom (Jr.) and Orlie Royal continued on the Stump Ranch from the early 1930's making it a working farm and dairy, while Tom continued working as a logger, who unfortunately lost his life in a logging accident around the Grandy Lake area in 1966. Tom & Orlie were magnificent examples of productive and hardworking folks who raised their children (Jacky, Bob & Doreen) the same. The property is stilled owned by Orlie, 90 years this August 2002; son Bob Royal has lived the bulk of his life here, Orlies grandson John Jonasson farms a section of the property also. Bob and my dad Phil Royal graduated together at Concrete High School in 1955, as did Bobs sons Kelly, Tom and Richard in the 1980's. Richard is a mail carrier in Sedro Woolley and will hopefully build a home in Birdsview in the near future. Folks I've talked to in the Birdsview area who grew up knowing Tom & Orlie speak nothing but affection for them both. Howard Royal and his family were in the Birdsview area until the end of WW2 on the north end of Lusk Road across the railroad track. Besides logging, he worked at Portland Superior Cement Plant in Concrete during the war. Jack Royal served during WW2 as did Shirley's husband George McLain, we will be celebrating their 60th anniversary this June 22nd in Olympia, Wa. Maudie had left the Birdsview area earlier at age 16 to marry in Pend Orellie Co. where father Tom Royal had been living and logging. (I'll work up a more extensive biography of Mabels Brood in the future). Mabel remarried in 1937 to Ollen Steen and stayed in the area until 1957 when they moved to Olympia, Washington to be near youngest daughter Shirley and her family. She spent 30 years married to Tom and nearly 30 more years married to Ollen, she passed away January 1, 1970 at the age of 78. A final note, it's an interesting feeling to pursue family history, your family tree, the stories and folklores, separating fact from fiction- hardships, hopes and loves. All I can say is I've never felt more grounded as a person getting to know these things, knowing this October 2002 will mark the 120th year my family came and lived a life in Skagit County during some pretty harsh pioneering times. We weren't the most important family in the area or in the making of Skagit County history. But I've got something unique and fun to do thanks to the 12th child of fourteen. I can pass that on to my children and theirs, share with anyone else interested in local family and community history. My great grandmother Mabel Boyd Royal-Steen, who started the ball rolling- I'm grateful and in awe of for the memories, wish I could have had more time with you.